The winds were forecast to be very light again for the return trip so we were pleasantly surprised to find enough NW wind to sail by in the start area. We opted for a timed run towards the windward end of the line. Having got the timing right we were fully up to speed as we crossed the line on the gun and forged ahead of the others who were slowly getting up to speed on to the tight reach out of the harbour. Longue Pierre quickly went for their asymmetric spinnaker and proceeded to get through our lee and race ahead albeit on a course lower than we wanted to sail. We were second out of the Grand Rade, Alchemist was slowly creeping up to us and came through our lee. Others attempted shy spinnakers but most appeared to fail apart from Blustery Day who stayed with us until the wind headed a little and dropped in strength. With a bit of discussion on head sail trim and noticing that Alchemist's headsail was sheeted outside the rail we opted for a similar approach with a barber hauled #1 using the spinnaker sheet to get the clew outboard and low. This improved our boat speed enough for us to start getting back to Alchemist and through her lee. After a few hours the rest of our fleet disappeared into the mist and we continued on 025 degrees towards Bembridge ledge. The wind came and went but we managed to keep up a reasonable speed until about 12 miles from Bembridge and homing in nicely. Shortly before this Domaine crossed our bows going more Easterly than us. Similarly we spotted Xara over to the East but behind our beam. The wind dropped to nothing, then after a short while came back as a NE giving around 16 to 19 knots apparent and now a beat against the tide to Bembridge Ledge, tedious especially as it was now dark. By the time we rounded the wind was starting to drop for the beat to the Forts. We could now see four mast head lights behind us but hadn't noticed any ahead. Being lowest rater in the class with four behind, as long as they were class five, was looking good for us. The first tack to No Mans Land fort took us within 50 feet of St Helen's fort. We then noticed a couple of mast head lights leaving the fort and heading for Ryde Sands, more of our fleet possibly? Things were looking up for a good position on handicap if all these lights were class 5. We had to tack around some anchored yachts off Seaview before the final tack out to the fort. The tide lifted us nicely around the fort before tacking for Ryde Sands and easing sheets a little. Ahead we suddenly noticed four masthead lights looking very stationary off Ryde Sands. We passed the post and then settled into the gaggle of boats waiting for a bit of wind to get us all to the finish. Having sat there for a few minutes we recognised Xarifa 10 feet from us and a slightly smaller boat just beyond her. It was all a bit eerie, all hushed whispers in the dark, what's the wind speed? Are we drifting onto the sands? A couple of times boat speed indicated then dropped to nothing. Another couple of yachts joined us from behind. Jazzy Jellyfish suddenly managed to fill her spinnaker and crept through only to drop back a few minutes later(we recognised a decal on her rear quarter!) Eventually the wind started to fill, the unknown smaller boat got going first followed by Xarifa then us. We headed for Ryde pier and slipped past Xarifa who was heading straight for Cowes. We were looking for the first of the turning tide inshore but soon realised that if we didn't head up we would have to tack to clear Castle point. We started to go dead close hauled from Ryde pier and hoped we could make the corner without tacking. Now the instruments started to disappear, we had been having new battery problems all weekend, we decided to turn everything off bar the masthead light(fortunately an LED version) and sail sans instruments. The windex was clear to see from the masthead light and the hand held GPS was ok on its own internal battery. We climbed up to Xarifa's course and pleasingly managed to stay clear ahead to the finish. The unknown boat ahead, having been higher than us across Mother bank, dropped down into Osbourne bay presumably to pick up the back eddy there but then had to tack out which enabled us to close on her. Just close to the point the wind backed causing us all to tack out before a final tack to clear Snowden. 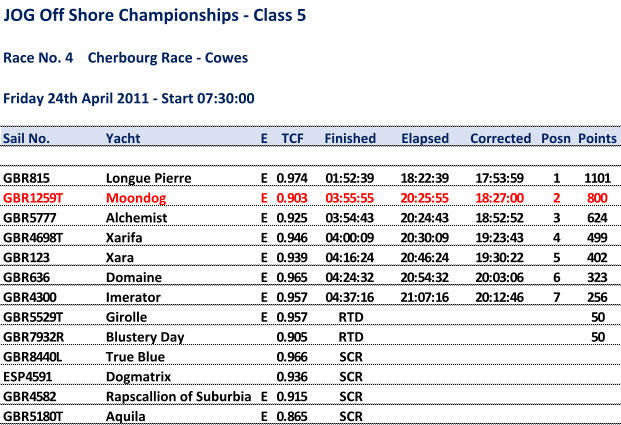 Tide now with we crossed the line at 03:55 close to the unknown smaller boat and were pleased to see that it was Alchemist, Xarifa finished behind us then we headed to our Cowes berth for a bit of shut eye. Another long race with very good first few hours and excellent for us last few hours giving us a second place to go with our third on the way out. Many thanks to Peter and Sandy and the start race officers. Such dedication to be on the finish line at four in the morning to clock us in, it really is appreciated.